I have the 10' rod and it's perfect for casting beyond the surf. Also works great for getting the line above the waves while in a rod holder. The reel is great and strong enough for pretty much anything you will catch. I have 80lb braid on it. This is my backup surf setup and it serves me well. works good and the reel is awesome. Bought this combo for the cape cod canal and the rhode island beaches and breachways. It was by far the best fishing investment I've ever made. It casts effortlessly as far as you have the skills to throw it, and the retrieve is so smooth. Have caught a few stripers in the high 40 pound range and you could definitely catch fish much larger with no problems. Highly recommended. I've been using Penn products for 30 years and they still have the workmanship. The rods tube wrapped handles are easy to grip and the light weight composite loads and casts well. And nothing else on the market I've used, cranks in line like a Penn reel. ProsQuality, modern materials and light weight. Nice aesthetics and strong combo for all surf, fish size ranges. 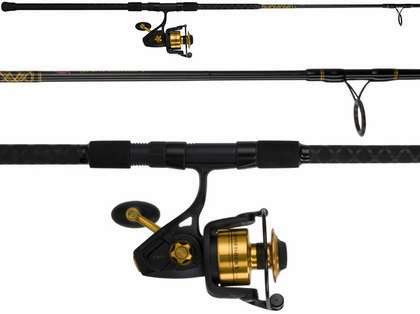 Just bought this combo - the Spinfisher 6500 just feels like powerful, but effortless. Went with 150 yards 20# mono topped off with 140 yards of 50# power pro moss green. The rod is heavy power, good for bait and heavy lures. I may look at an 8 or 9 ft. Medium power for some of my lighter plugs. 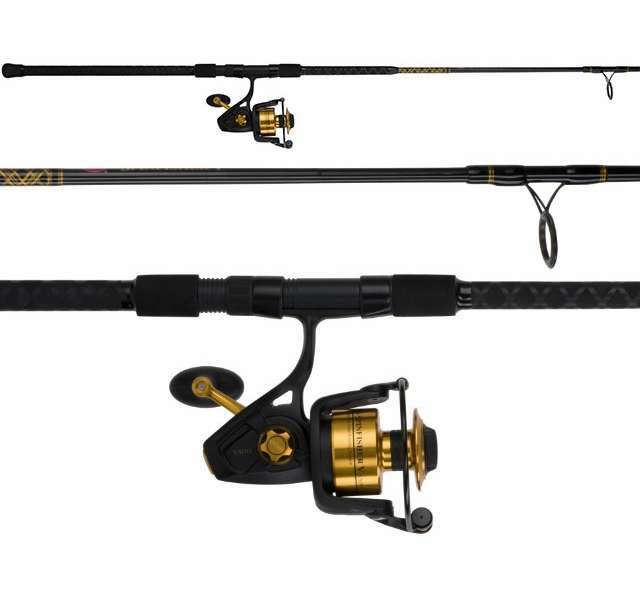 Just bought this Penn rod/reel combo from Tackle Direct. Great customer service and fast shipping. I bought this combo to surf fish the beach here in Destin Florida. I rigged the reel with 300 yards of 50# Power Pro moss green braided line and a 5' 50# fluorocarbon leader casting a 3oz pyramid lead sinker and live shrimp. I was more than satisfied with the smooth powerful casting ability of the rod and the the reel retrieve is outstanding, you can immediately feel the power of the SSV6500 gear box in action. Smooth micro adjustable sealed drag and sealed bearings makes for easy clean up when the fishing done. The Shimano TMS-70MH Teramar Inshore Southeast Spinning Rod would match well with the Spinfisher 6500 fishing for tatuog from jetties as well as lighter wreck fishing. Is this interchangeable left vs. right hand retrieve? The Penn Spinfisher reel can be used L/H and R/H. The rod as shown on website is a 2 piece rod. thank your for considering TackleDirect for your fishing needs. Hello Christopher. This would be an excellent combo for you! The Spinfisher is the perfect reel for your application! Please feel free to contact us if you have any more questions!